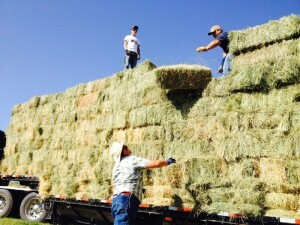 We will arrange shipping for your load of grass-alfalfa horse hay to anywhere in the continental U.S. We do not own trucks, but we have several truckers who are experienced in hauling hay. It is your responsibility to pay the trucking. Our ZIP code is 81415. Go to google.com/maps and type in our ZIP code and your destination, and you can figure out how far we are from your hay barn. In 2015, hauling rates are averaging $3 a loaded mile. As fuel prices escalate, that rate may go up to $4 a loaded mile. We will not ship quantities smaller than a semi load, unless it’s going to the Roaring Fork Valley or a radius within 80 miles of our ranch. We will not ship small loads to Denver or the Front Range, but we sell to a retailer in Denver who can provide you with small quantities of high-quality hay on the Front Range. Call us and we’ll provide the contact info. We’re about 220 miles from Denver. A typical semi load shipped to Denver, Colorado Springs, Parker, Calhan, or other Front Range destinations usually costs between $800-$1,200 a load, depending on location. You, the hay buyer, are responsible for off-loading and stacking your hay. (16”x18”x39”, 65 pounds) Note: Our prices include loading the hay on a trailer and ready to ship. Normally the loading price is about $1 a bale.